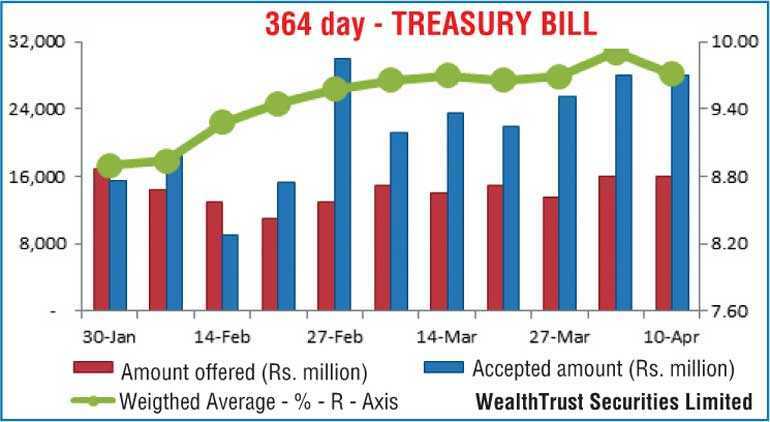 The weighted average at yesterday’s weekly Treasury bills auction on the 364 day maturity was seen dipping to 9.71%, recording a drop of 20 basis points and reversing its upward trend witnessed over the previous two weeks. All bids received for the 91 day and 182 day maturities were rejected for a third consecutive week. The total offered amount of Rs. 28 billion was accepted only on the 364 day maturity as its total bids received stood at Rs. 64 billion against its offered amount of Rs. 16 billion. Secondary market bond yields were seen increasing in morning hours of trading yesterday mainly on the liquid 15.03.23 and 01.08.24 maturities to intraday highs of 10.07% and 10.20% respectively against its previous day’s closing levels of 10.00/05 and 10.13/20. 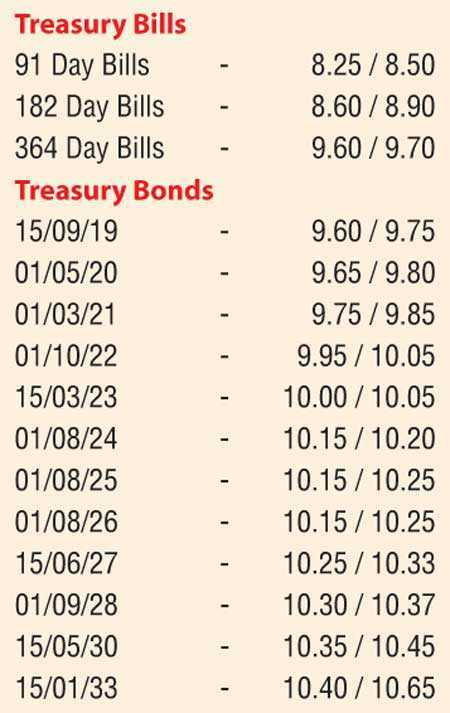 However, buying interest subsequent to the Treasury bill auction outcome saw yields dip once again to close the day flat against its previous day’s closings. The total secondary market Treasury bond/bill transacted volumes for 9 April 2018 was Rs. 8.04 billion. In money markets, overnight call money and repo rates averaged 7.87% and 7.95% as the net surplus liquidity in the system stood at Rs. 38.32 billion. In the Forex market, the USD/LKR rate on spot contracts were seen closing the day mostly unchanged at Rs. 155.55/65 subsequent to trading within the range of Rs. 155.45-Rs.155.60 yesterday. The total USD/LKR traded volume for 9 April 2018 was $ 57.95 million. month - 156.25/40; three months - 157.80/95 and six months - 160.00/15.